If Lost and Gilligan’s Island had a baby, it might well be Wrecked. The first season of this comedy TV show did well enough to score a second season renewal. Can this TBS sitcom repeat the magic and maybe even build its audience? Will Wrecked be cancelled or renewed for season three? Stay tuned. A single-camera comedy, Wrecked stars Ally Maki, Will Greenberg, Brian Sacca, Asif Ali, Brooke Dillman, Jessica Lowe, Ginger Gonzaga, Rhys Darby, and Zach Cregger. The TBS satirical comedy follows a diverse group of strangers who are stranded on a deserted island after a plane crash. It’s a dangerous new world where they face many threats — mostly brought on by themselves. No longer plugged into the rest of the world, the group struggles to navigate their makeshift society while also learning to live without modern comforts. For comparisons: The first season of Wrecked on TBS averaged a 0.45 rating in the 18-49 year old viewer demographic and 1.251 viewers. What do you think? Do you like the Wrecked TV series? Should it be cancelled or renewed for a third season? 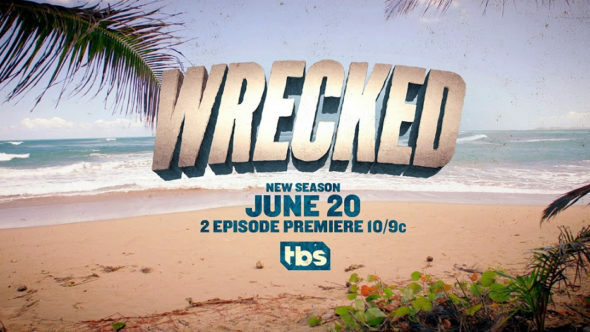 9/13/17 update: TBS has renewed Wrecked for a third season. Details here. Wrecked: Cancelled or Renewed for Season Four on TBS? Wrecked: Cancelled or Renewed for Season Three on TBS? Please, don’t cancel this show. I think is very funny show. Please renew wrecked for season 3. So fantastic! The story gets more exciting every week ! I can’t wait to see what kind of trouble they are facing this time. Best show! SO original! Please bring this show back!!! Looking forward to Season 3!!! I think this show is hilarious. I can’t quit laughing, please don’t cancel. So much fun to watch. I think the show is hilarious. Also, I think it has great potential with the right direction. It should definitely be renewed!!! My 14yr old son & I enjoy this fun & cooky casted bunch. We hope it’s renewed for season 3. It’s a laugh a minute. Great show needs to be renewed !